Caught changing your research results or data in college? Defense tips. I am being charged with cheating because I falsified my data and research results. If you conduct research, run statistics, or record data in other ways, you cannot change the results. If you do change your results, you could be charged with cheating due to falsification. What happens if I am caught faking data or research findings? This depends on your university. Check your student handbook under academic integrity violations to be sure what to expect if charged with cheating by falsification. What can happen if I am found guilty of faking my research results? The university will sanction you. The punishment depends on the severity of the violation and if you have had any other academic integrity issues. I have seen sanctions range from a warning up to dismissal and expulsion from a university. Can I appeal my disciplinary sanction for cheating? Yes. This appeal is often the last chance a student has at fighting a disciplinary sanction and is a written submission to the dean or provost of the university. I write appeals for students using my extensive background as an appellate attorney and specialized knowledge of the academic disciplinary process. Can you help me defend against the charge of falsification? 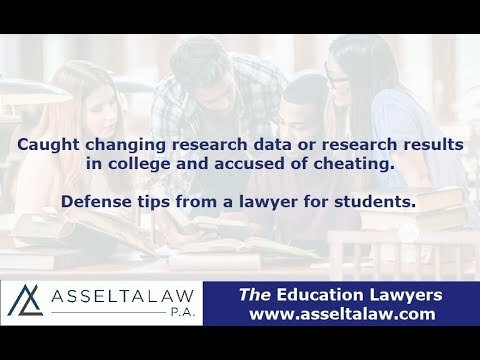 Richard Asselta is an award-winning student defense lawyer who offers academic advising services throughout the United States. He is experienced in defending all types of college disciplinary issues, including falsification.